Apart from pruning and fighting pests and diseases, which are discussed later, the maintenance of roses is not an onerous task. Ensure that any roses loosened by the ravages of winter weather are well compressed. Step on the soil around the stem. Make sure that any broken stakes, posts, trellis, etc. are replaced or repaired. Particular attention should be paid to renewing worn out burlap that is protecting the bark. This can often be done when the ground is too wet or too frosty to work. Mulching helps to keep the soil moist, keeps its temperature steady, gives the roses a cool root-run. In addition, as the substances used for mulching provide humus they help to condition the soil and supply slowly-released plant foods. A mulch also keeps down weeds. It is also claimed that, because it prevents rain from splashing up from the ground on to the lower leaves of a rose bush, it reduces the spread of blackspot. Rose beds should be mulched in May, when the soil has begun to warm up. A mulch is a layer, upwards of 2 in. thick, of an organic material. One of the best is well-rotted garden compost. Other suitable substances are moist peatmoss, buckwheat hulls and rotted farm yard manure. Leave a small ring around the base of each rose, to avoid the risk of damage being done by the heating up of the mulch as it decomposes. Contact: this type of weedkiller is watered on to the leaves of the weeds in spring and summer. The chemicals are absorbed and the weeds soon die. Pre-emergent: this sort interferes with the growth of the seedling leaves and they do not emerge from the soil. It is applied in the early spring. Often during the spring, three shoots emerge from one bud center. As soon as they are large enough to handle, the outside growths should be pinched off, and the center one, which is usually the largest, should be allowed to develop. Suckers are shoots that originate low down on the rose tree or beneath the ground. They grow from the root-stock and not the scion or budded variety. If they are allowed to remain, they sap nutriment from the main stems. The most satisfactory way of discern­ing a sucker is to note from which position it originated. If the shoot appears from below the union or from the root, it is a sucker and should be torn out, not cut away, at its point of origin, scraping away the soil, if it appears from below the ground. By tearing it out, the whole budding system is destroyed and there is little chance of it reappearing. Some hybrid tea roses, instead of growing one terminal bud, develop three on a stem, while others grow their flowers in clusters. Disbudding consists in removing all the side-flowering shoots, when they are just large enough to handle, leaving one terminal flowering bud. Whether this is carried out is largely a matter of personal taste. Nothing should be done if a good, massed display of color is desired, but if large perfect individual blooms, say for showing, are required, it should be carried out . If there is to be good repeat flowering, removing the spent blooms as soon as they fade is essential. The stems should be cut off at the first outward growing leaf with five leaflets to avoid removing too many leaves, which are important because they are part of the apparatus by which the plant produces its food from light (photosynthesis). 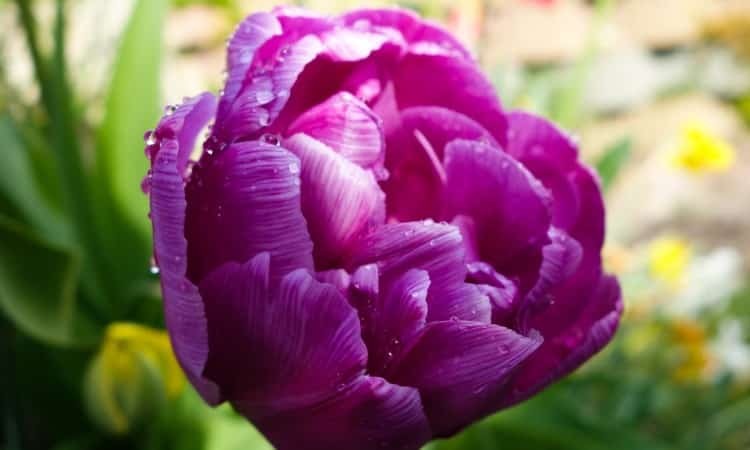 When watering, the blooms and the leaves should not be wetted, because the former will become blemished and moisture on the latter will encourage fungus diseases. The use of a perforated hose, turned upside down and interwoven among the plants avoids these possibilities. Fall and Winter To prevent bush roses from being whipped by winds, cut back tall stems in November to halfway. Roses should be sprayed, or watered, in December, where weather conditions permit, with 8 oz. of Bordeaux mixture mixed with 2+ gals of water, to minimize the effects of fungus diseases.